May 16, 2006 : Camp Meeting: The March 2006 meeting of the State of Dade Camp 707, Sons of Confederate Veterans will be held at 7:00 P.M. on Tuesday, May 16, 2006 in back of the Easy Rental Store on Highway 11 at the south end of Trenton. We will meet to eat at 6:00 P.M. – there will be no retreat! Call 657-5000 for directions. May 19-21, 2006: Battle Re-enactment: The annual re-enactment of the Battle of Resaca will be held on the weekend of May 19-21, 2006 at Resacca. This is always an outstanding event. This year will be the first year that we have had our camp sales booth at the event. All who can are urged to help. May 27, 2006: Parade. The annual 1890’s Parade and celebration will be held on Saturday May 27, 2006 at Ringgold, Georgia. We will lead the parade and have the camp sales booth. We hope you all will be able to attend this important event. Call 657-5000 for additional information. June 17-18, 2006: Georgia Division Convention: The annual Georgia Division Convention will be held on June 17-18, 2006 at Gainesville, Georgia. There will be additional information at the camp meeting. State of Dade, Camp 707 accepts its covenant of responsibility to preserve the Christian principles held by the Southern people which led to their decision to defend constitutional self-government. 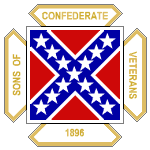 Our mission is to preserve the memory of the noble Confederate Soldier, Civil Servant and Loyal Citizen of the Confederated States of America.